After receiving a distressing message from your uncle, you travel to the remote village of Transvaal. But when you arrive, your uncle is nowhere to be found. As you search for him, you learn that he has been traveling the world, hunting down a woman named Morgana, and that this is not the first town to encounter her deadly wrath. Soon, victims start piling up, all of them bearing the same strange bite mark, dripping with venom. But is this the work of Morgana... or something even more sinister? 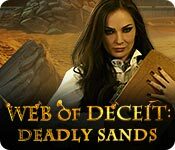 Tread carefully -- the sands are always shifting in this thrilling Hidden-Object Puzzle Adventure game!